"Hear2Heal" is a unique collaboration between the talented students at CHS and singer/song-writer Eliot Sloan, lead singer of the international recording band Blessid Union of Souls. 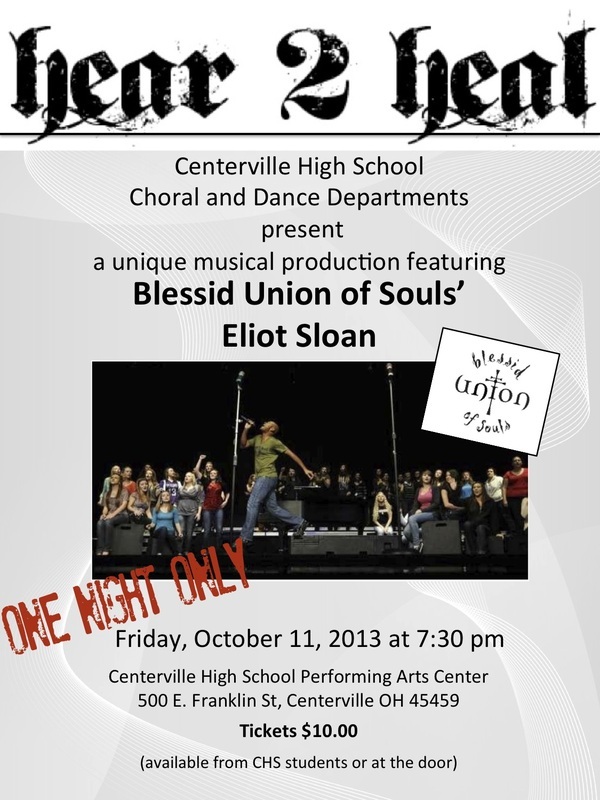 "Hear2Heal" will highlight the talent of CHS choirs, soloists, instrumentalists and dancers. Choir members auditioned for key vocal and instrumental solos, auditioned to dance in the concert, and a few even sang their own original songs for the opportunity for them to be included in the concert. This event is a fundraiser for the choral program. We appreciate your support. The Ohio based group Blessid Union of Souls received international acclaim with their hit songs "Hey Leonardo" and "I Believe." Recently, Eliot Sloan has dedicated his time and talents to reach out to young musicians and to help raise support and awareness for the performing arts in the public schools. Centerville Choirs prepare for concert "Hear 2 Heal" with Eliot Sloan from Blessid Union of Souls. to CHS Choirs for receiving Superior Ratings at OMEA 2014!